Great for cookies, etc, this is a smaller food spatula. The stainless steel blade is fairly thick and heavy, so it doesn't have much flex. The end is beveled, though not especially sharp. Like all fine wood items, the handle of this product should not be washed in a dishwasher. Please hand wash and dry to assure long lasting beauty. 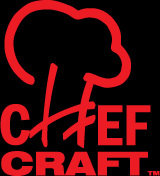 Made by Chef Craft in China.